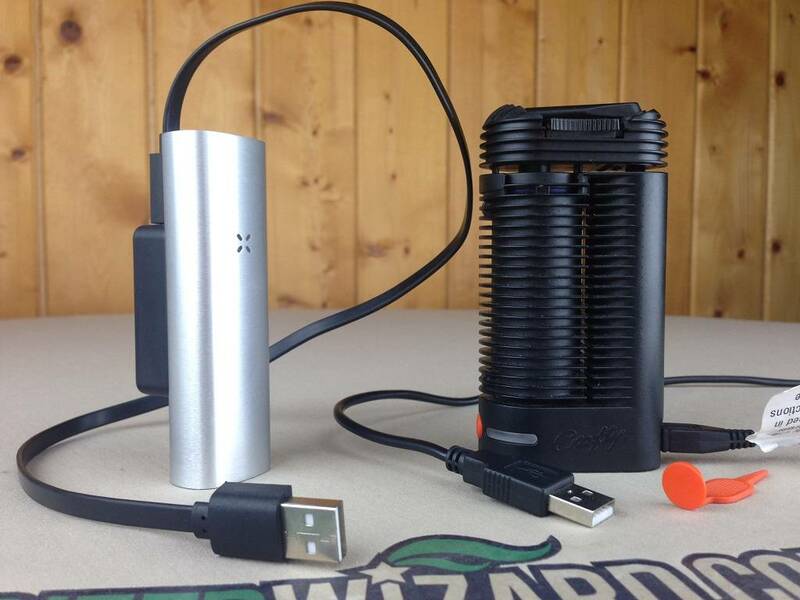 This will be a comparison between the Pax 2 and the Crafty portable vaporizers. The Pax 2 is one of the smallest, lightest and easily concealable portable vapes on the market. While the Crafty offers a full temp spectrum (104F – 410), produces extremely smooth/cool vapor plus more efficient and consistent with my herbs. Below I’ll break down all the pros/cons, explain the different charging systems, go over the temp options and talk about some of the cleaning/maintenance involved with both the Pax 2 and Crafty. Before we get into the comparison, prices have dropped a few times on both of these units and the new Pax 3 is out. The Crafty is now $279, the Mighty is $349, the Pax 2 is $149 and the Pax 3 is $249. 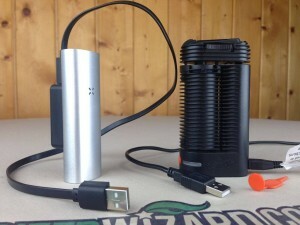 I also recommend checking out my top portable vaporizer list for more options. The Pax 2 is a bit better in the heat up time department, it comes with a 10 year warranty, and it’s still the most portable/concealable vaporizer currently on the market. 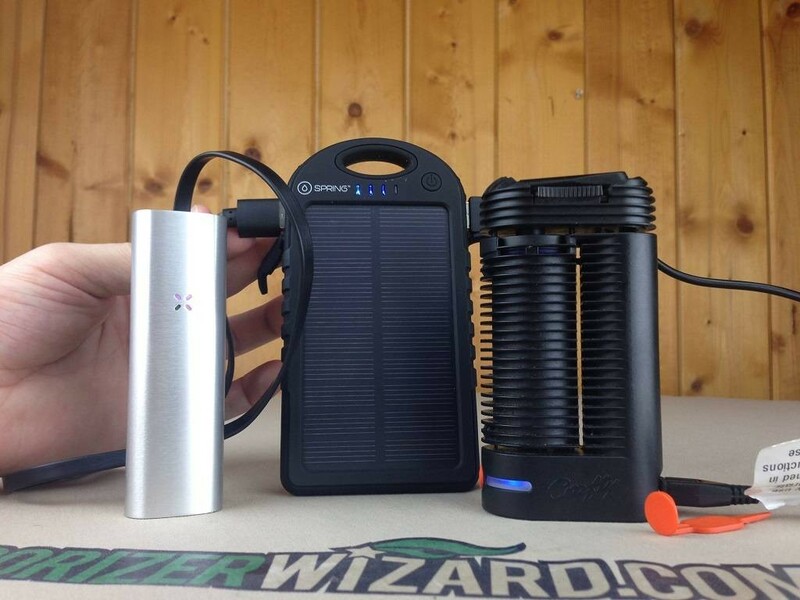 The Pax 2 is my go to vape for outdoor activities especially in group scenarios. 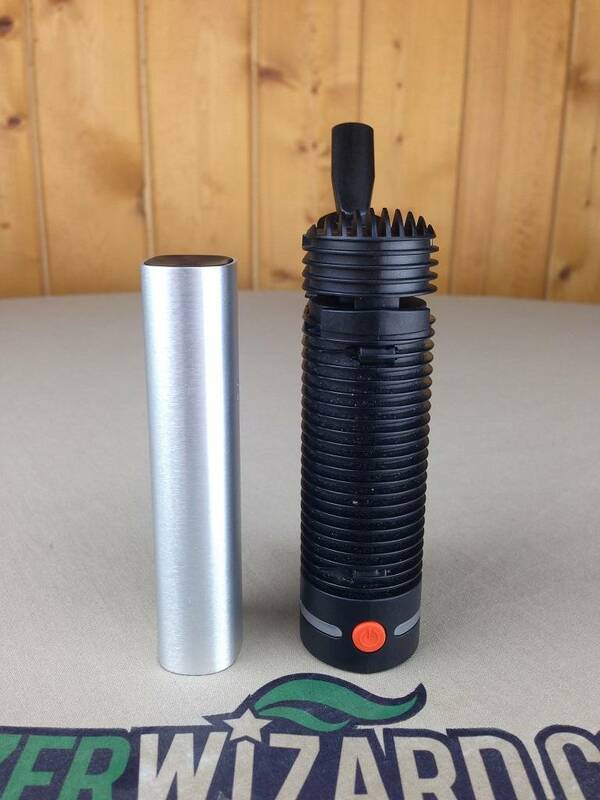 In the end, both of these vaporizers are very good and you will be happy with either one. The Crafty is the slightly larger unit at 4.3”H x 2.2”D x 1.3”W and the Pax 2 comes in at 3.87”H x 1.21”W x .085”D. The main difference in the size category is the weight; The Pax 2 weighs roughly 92 grams while the Crafty is around 136 grams. Mind you both of these are actually really light for a portable vaporizer. By comparison, the Firefly weighs 241 grams, the Ascent weighs 192 grams, and the Mighty weighs 230 grams. The main thing you’ll notice in size the bulkiness to the Crafty. You can still fit it in your pocket but it’s definitely not the streamlined smooth design of the Pax 2. Both battery systems are good for today’s charging capabilities. The Pax 2 comes out on top as far as average continuous use. They also upgraded the battery compared to the original Pax so it will pretty much crush the Crafty in continuous use. However, the Crafty can vape a full oven quite a bit faster than almost all portables including the Pax 2. So the Crafty still vapes a good volume of herbs per charge despite medium to low continuous use time. Neither units use replaceable batteries but both offer the option to charge via USB. I just picked up a battery pack off amazon for around $25 and it will charge both of these units from dead multiple times over. I definitely recommend this option if you are going to be taking it on long day activities. *Pro-Tip: If you already have the original Pax, you can use the old charging base cord to plug-in directly to the new charging system so you can charge via home outlets. TL;DR: The Pax 2 has longer battery life, both will charge about the same speed and both can be charged via USB. The Crafty is a hybrid unit so it uses both conduction and convection heating methods. It will use a slight amount of conduction in the beginning to heat the chamber and mostly convection from then on out. The Pax 2 is 100% conduction and definitely the less efficient model of the two. The Pax 2 will hold quite a bit more herbs which some people like and some don’t. It’s completely up to you and what you want out of a vaporizer. The Pax 2 chamber is huge. I can get about .25 grams with a medium coarse grind and if I run it through the MFLB Finishing Grinder, I can get upwards of .4 grams into the chamber. This is a lot for one person unless you’re a heavy user (likes yours truly) or going to be passing it around with friends. There are a few different methods to use smaller loads in the Pax 2, one company came out with a “sandwich” that is basically a stainless steel press to eliminate all the extra space in the chamber. This allows for smaller bowls for 1 or 2 people and doesn’t make it quite as wasteful. I am currently doing some testing on a few different methods of partial loads. I’ll update the Pax 2 review and this review as soon as I finish up. One of the biggest differences between the Crafty and Pax 2 is the amount of resistance during draws. The Crafty has one of the most free flowing vapor paths of any portable currently on the market. Whereas the Pax 2 has a lot of draw resistance if you don’t draw slow. The Pax 2 definitely requires a bit of technique while drawing. I recommend a long slow draw for about 10-20 seconds. The Pax 2 is also more affected by the type of herbs you are using, what temp you are vaping at, how fine/coarse your grind is and how full/tight you packed the chamber. With the Crafty you can literally pack the chamber in any fashion and get the same results. You can put in .05 or .25 and always get consistently even AVB. The lack of resistance allows me to take HUGE draws which is something that I personally like but it’s not for everyone. The Crafty uses two temp settings but you can change those two temp settings to anything ranging from 104F to 410F via the smart phone app. You can use the app (available for iOS & Android) to control the two temp options, check battery life, and see your temp in real time, and various other less important features. I really like being able to see the actual temp because I can control my draws to maintain temp the best. The Pax 2 comes with four different temp settings which is an upgrade from three on the previous Pax model. The new Pax 2 temps range from 360F – 420F (Original Pax 370F – 410F). Each range is controlled via the temp of the herbs rather than the temp of the chamber to ensure a more consistent draw from first to last. The new Pax 2 is definitely an improvement over the original but still not as efficient as the Crafty. The less maintenance of the two would have to go to the Crafty. I literally used the Crafty for 30+ days without cleaning it (testing purposes, don’t recommend). The only issue that I ran across was the mouthpiece would get stuck and wouldn’t turn around but you can just wait for the unit to heat up and it will turn around just fine. Now I don’t recommend doing this because you can damage the mouthpiece if you try to crank on it without it warming up. This was just for testing purposes. You can get away with cleaning the Crafty after 20+ sessions or so and it will take around 5 minutes. The Pax 2 is a HUGE improvement in the cleaning department over the original Pax but still not quite as the Crafty. The Pax 2 works best if you use a find grind and tight pack. This causes a bigger mess than say using a coarse grind with a light pack. The herbs are much more condensed and the finer particles get everywhere. The good thing is that even when the new Pax 2 gets dirty, it will still work! Yay! Downside is the draw resistance is increased the longer you go without cleaning so I recommend running a pipe cleaner with some ISO down the vapor path after about 10 sessions. The mouthpiece is no longer in the vapor path and no more lubricant to mess with. Just clean the vapor path and the oven. Total cleaning session for the Pax 2 takes less than 5 minutes so it’s still not that big of a deal but the Crafty is definitely the easiest of the two to maintain/clean overall. Overall the better unit would be the Crafty IMO. Much less draw resistance, most efficient with your herbs, and full spectrum temp control. The main reason that would sway me into the Pax 2 would be the extra portability/pocketability along longer battery life. The Crafty has a pretty average battery life but like I mentioned earlier, you can plug it in practically anywhere via USB. The Pax 2 is also the slimmer streamlined unit so I could see myself picking the Pax 2 for portability. The Crafty is just an easier unit to maintain and use. I really enjoy the smooth, cool vapor produced from the Crafty and the smartphone app makes changing the temps extremely easy. Both of these units are two of the best vaporizers to come to market and I highly doubt that you would be upset with either so don’t beat yourself up over it too much. Please leave a comment below if you have any more questions about these two units or if I missed anything that should be added to this Pax 2 vs Crafty vaporizer comparison. Feel free to post your experiences below with either device so fellow vaporents can get some more viewpoints. Thanks for taking the time to check out my site and have an awesome day! Smell is a large part of stealth, and discreteness. How do the units compare in smell when not in use? Thanks! I currently have the pen style AtmosRX Orbit for which I find the draw way too restrictive. I want to upgrade, and was hesitant about the Pax for some reason. Now with more research I narrowed my choice down to the Pax 2 or Crafty, and of course found your review. Over the long run, the most important question I have is cost/efficiency. The more wasted herb over time, the more expensive the unit becomes. So assuming the draws being equal (which I know you say the Crafty is better) – which unit over time will save you more money in herb by making it’s chamber last longer (more draws)? The Crafty wins on herb use efficiency if you are looking at the level of medication achieved compared to amount of herb used. The Crafty and the Mighty are some of the most efficient portables in that regard. However, they have a lot of power, so they actually finish a bowl faster and in less draws than the Pax 2. When someone like myself only want a session to be a few draws, and maybe have a couple of sessions a day, my concern is efficiency with the herb. Of the two, which unit based on my usage will give me better value by saving $’s on herb in the long run. I’ve already read the screen method for the Pax 2 where you only have to fill the chamber 1/2 full, so assuming that’s what I do, which unit would you suggest? Based on what you told me I would go with the Crafty/Mighty. Both of these units are much more efficient when it comes to saving herbs overall. You can load the Crafty with any amount and any style with the same great results every time. Lastly, the draw resistance is the big deciding factor for me. The Pax 2 has quite a bit of resistance whereas the Crafty is one of the most free flowing portable vapes I’ve ever used. Let me know if you have any more questions Jon and thanks for taking the time to check out my site. After more research guided by your opinion, I decided to pull the trigger and went for the Crafty. The first vaporizer I owned, the Magic Flight Launch Box, I like. I have the power adapter for home use, and it does an admirable job. I just don’t like how it’s in pieces. My second one purchased last year is the AtmosRX Orbit. I’ve just never been happy with it. I find the draw to be difficult, and I don’t feel like it’s very economical with herb. I ordered the Crafty Wed night, and got overnight express delivery for free because I spent over $349. It arrived at lunch today. Easy to set up. The app works fine with my Samsung Galaxy Note 4. I will admit at first feel, I wouldn’t say it feels flimsy at all, but maybe it’s just me but plastic generally resonates through my fingers as cheap. Also, my mind thinks that based on size it should be heavier. But in reality it feels solid and very light. It made me wonder why it was so expensive, as $339 for a portable was at the top of the price heap. The Magic Flight and Orbit are half the price, even when I paid full price when they were first released. Any thought of cheap went away though when I used it. My goal was simple. Find a vaporizer that could easily handle a one hitter amount with ease. The Launch Box’s bowl size is too big for that, and requires quire a bit of herb to vape properly, and also needs several mixes. The Orbit with it’s difficult draw just never has felt right to me. The Crafty – well, as close to perfect as I had hoped for. I put in probably a tad more than a one hitter size, and used the oil pad to fill the rest of the chamber. I got a good 10 draws, and the draws were effortless. Nice and cool draw (ran 175C with a +10C boost towards the end of the single session). The taste was near perfect, and the remains were a nice un-burnt brown. The first two vaporizers I owned never made me want to put away my one hitter, even with the carcinogens associated with it. That changed tonight. I have found my new friend, the Crafty. Thanks Buzz for pushing me to my final decision. In the short time I have read your reviews, I respect the information provided. Can you tell me which one produces cooler vapor between crafty and pax 2?? I already have an arizer solo for half a year, vape quality is nice, though sometimes I feel it is too warm on the higher temps 7 or 6…. I would go with the Crafty. It goes reallllly low. Even low enough to do actual herbs. The more I’ve used my Crafty/Mighty I find myself lowering the temps. I even start out at around 350 and lower sometimes whereas the Pax 2 starts out at 360 and goes to 420F. This kind of goes both ways because Crafty/Mighty can only go up to 410F and some people like the higher temps sometimes too. It all depends. Lower temps, smooth vapor, I think the Crafty. Aight! Yeah I think I will go for the crafty!! Pax 2 will have the most draw resistance of the three units you showed me. The Crafty will have the least. I’m kind of leaning towards the Firefly just because you make it seem like you aren’t a heavy user. You like to take a couple puffs and move on about your day. The best thing about the Firefly is the ability to turn it on and be vaping in less than 10 seconds. That wait is about 2 minutes 30 seconds with the Crafty and about 50-80 seconds with the Pax 2. Also both the Crafty and the Pax 2 use conduction heating, (Crafty is mostly convection but some conduction) so the chamber will be hot the entire session. This will increase the smell in the room while it’s heating up and cooling down. So the best choice I think might be the Firefly or go with the Crafty because it’s the most free-flowing vaporizer (IMO) currently on the market. You literally just take your draws and get amazing clouds. Plus you get the full temp spectrum with the Crafty. The Crafty just takes forever to heat up. Let me know what you decide to go with and if you have any more questions. I do make a small commission if you buy through my links. Thanks! Have a great day! I didn’t mention I replace the restrictive screen plate in the bottom of the bowl with the cut screen I made… Though that may have been obvious…. No I think you should go with the Crafty. Less draw resistance and definitely more efficient. 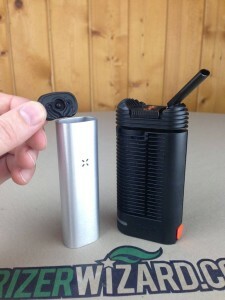 Although the new Pax 2 has a lot more options now for smaller bowls or single sessions. The only thing that I don’t really like about the Crafty is the slow heat up time and the battery life. If you absolutely need 60-90 minutes of use without carrying around an external battery pack, then I think you should go with the Pax 2 because you’ll be disappointed in the Crafty battery life. I have a couple of Craftys 2ND to none ,especially since Storz and Bickel upgraded the thickness of the outside ribs of the Crafty ….SUPER Durable…..
Hi. Thanks for the review and comparison! I’m currently deciding between the two (with cost being a large factor, but also efficiency). I have one question which kinda relates to both units: has anybody reached a “hard limit” of recharges with these units? Much the same as with smartphones, I dislike intensely this new lean towards non-replaceable batteries. It would be nice to not worry about the battery reaching its recharge limit. It concerns me more with the Crafty; a 2 year warranty is a lot different to a 10 year warranty! Also, in the Crafty’s manual, it states that using it for any herbs not listed in the manual is “inappropriate and potentially dangerous”. Would this mean they wouldn’t take back a unit used for MJ?? Hoping for some answers, thanks! Both the Crafty and the Pax 2 can be sent back to have the battery replaced if it goes bad. Both manufacturers will replace a battery that goes bad too early, however S&B doesn’t seem to like to replace the batteries w/o at fee once the units are passed around 60 hours of use. As far as shipping a warranty item, just clean it very good with iso, and with the Crafty specifically, they only have you send in the body. You keep the cooling unit, which is where most of the buildup occurs anyways. Thanks for the reviews– very helpful. I’m a daily smoker; when at home, I prefer combustion from the water pipe. But I need something for being out & about, which places discretion & convenience as the top goals; I’ve made my peace with the efficiency trade-off here. I want to be able to step into the restroom at the movie theater, I want to vape while walking down the street without a big cloud or smell, I want something I can slip into my jeans pocket, I want something I can fly with and take through the TSA. Sounds like all else being equal, the Crafty is just better quality. But it’s also larger, more conspicuous, and takes a while to heat. Does this argue for the Pax 2? Or should I take a look at vape pens? Or something else? Thanks! Dry herb vapes will all smell while heated up, so bathroom use at the movie theater is generally a no go. But both the Pax2 and the Crafty will work well for walking down the street, and I have also taken them both on Airplanes, however I clean the Pax2 very well before flying, and I buy a brand new cooling unit for the Crafty for each trip so I know its fully clean. I think both the Pax 2 and the Crafty will work well for you, but I would also take a look at the Grasshopper if you don’t mind waiting a few months for it to arrive (it’s pre-order) The hopper is more portable, faster heatup and less smelly than the pax2/crafty. One of the main reasons I wanted to buy a vaporiser was discretion over combustion when it comes to smell. I have decided on the Crafty over the Pax 2, due more to efficiency than anything else. That being said, what is the smell like from the unit? Does the odor dissipate quickly? Can I be sure that the smell will not linger in the house for hours after a session? I guess one way to disguise the smell is to vape with other herbs such as peppermint etc. A good rule of thumb seems to be that vaping smells about half as much, and the smell dissipates over twice as fast. The Crafty is a lower smelling unit than the Pax 2, so if smell is important that is another reason to lean towards the Crafty. Another option for disguising the smell is to make a sploof or buy a pre-made one like the ‘smoke buddy’ which use activated carbon to filter the smell. They really help quite a bit! Smells for about half an hour after vaping but does not linger due to it being vapor not smoke. I’m on my third Crafty in 12 months, which has just gone back to be replaced. Each has cracked around the screws and at the front plastic cooling unit fastener. The most I’ve reached is 200 hrs use on the last one. The others failed around 110 hrs. At 200 hours the power button failed and the heating unit became lose. 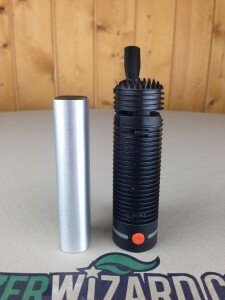 Its a real pity because the vapor quality is amazing and Storz and Bickel have replaced them all but ultimately I couldn’t recommend this to a friend as the materials used (plastic with metal screws) combined with poor industrial design are causing consistent failures. I would go with the Firefly 2 or the Grasshopper if you wanted the least smell. Something that heats up and cools down quickly. You can use a spoof or a smoke buddy on the exhales to help with the smell in the room. All vapes will smell but convection vapes specifically will smell a lot less than conduction vaporizers like the Pax 2/3/Crafty. Hey Buzz! I’m considering to buy crafty but I heard that it’s effciency is not that good(what I’m trying to say is that crafty conntinues to vape while you are not hitting draw), and I really don’t wanna waste my weed. Also I will be vaping alone most of the time, so do you think that crafty is a good choice for me or should I go with pax 2? 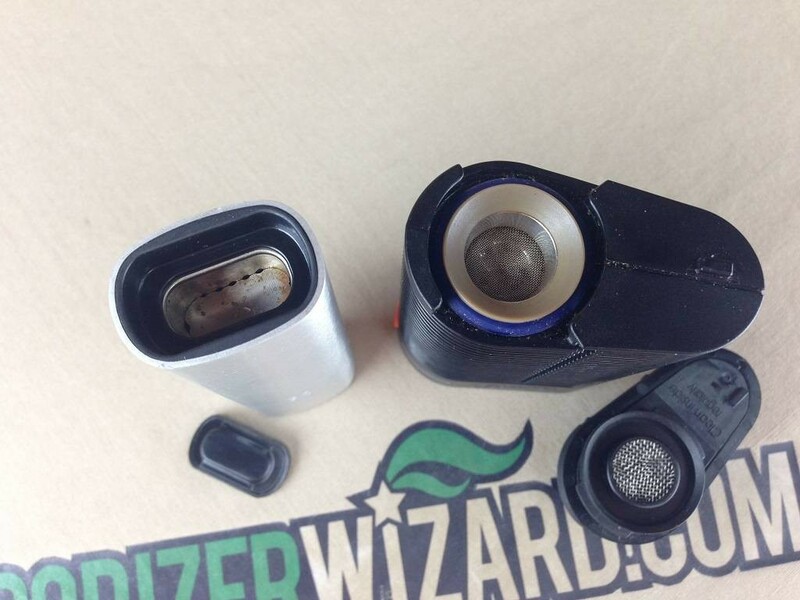 Sounds like you want a convection vaporizer like the Firefly 2 or the Grasshopper. Both of these units will only heat your herbs as you are drawing. The Pax 2 will be very similar to the Crafty but not as good on overall vapor quality. Much more portable but overall I prefer the Crafty by quite a bit. Check out my reviews for the Grasshopper and the Firefly 2 and let me know if you have any questions! At my local store the pax 2 is $200 and the crafty is $280. While the crafty sounds amazing (especially since it’s convection) is it really worth the extra cost? They should both work great for you and I still use both the Pax 2 and the Crafty in 2018. The biggest advantage for the Crafty is going to be the improved vapor flavor and density as well as the reduced draw resistance (so it’s more free flowing when you take rips). With the Pax 2 the advantage is going to be the smaller size, more rugged body, and more powerful battery. So they do have their own strengths but I personally enjoy using the Crafty more due to the flavor and low draw resistance.